(37x29) Mens Vintage 70s Wool Disco Pants! Red, Green & Blue Plaid! Buttons For Suspenders! 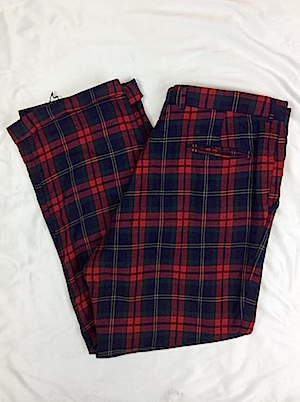 Home > Items just added 4/3-4/17 > (37x29) Mens Vintage 70s Wool Disco Pants! Red, Green & Blue Plaid! Buttons For Suspenders! 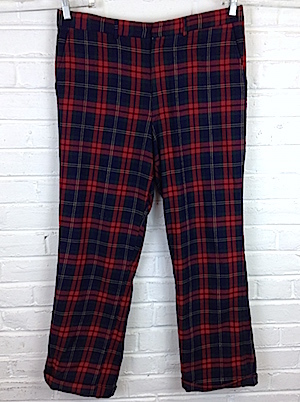 Mens vintage 1970s wool Xmas disco pants! 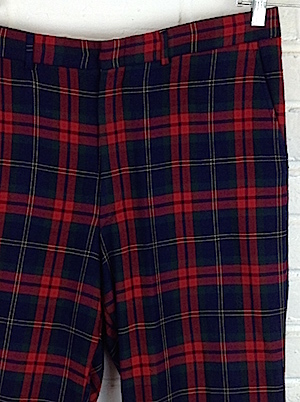 Disco dance or get groovy on your holiday in these red, blue, green and yellow wool plaid pants. Closes in the front with a hidden tab closure and a hidden tab closure for a more secure fit. Has six interior buttons so you can easily wear them with your favorite pair of suspenders! Two side pockets and two inner pockets in the back one with a button closure. Bottom of the pants are cuffed. Pants are not lined on the interior. David Brooks Ltd. No material tag, but feels like 100% wool. Inseam: 29" w/ 1" cuff that can be let down.